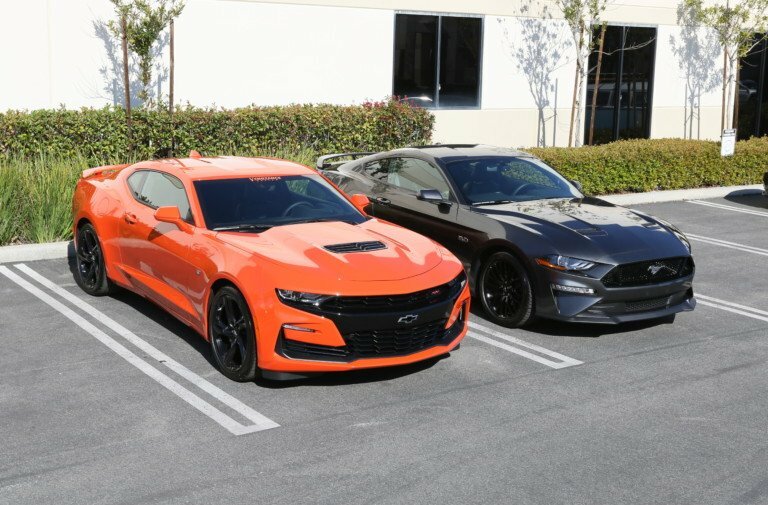 Pony Wars isn’t just about pitting a stock 2017 Mustang GT and Camaro SS head-to-head to see who’s better. You can get that info by reading regular old car reviews – boring ones. No, what we’re here to find out, at the end of the day, is which car responds to modifications better especially when a budget is a constraint. After all, most of us don’t have unlimited stacks of cash sitting around to modify a car that likely cuts into your budget with a car payment. That’s why both Team Camaro, led by yours truly and backed by LSX Magazine, is going up against Team Mustang, headed up by Steve Turner of Ford NXT with two set budgets. First, $5,000 in mods for bolt-ons and then $15,000 for a boosted shootout. To ensure our budgets are fair, we will be using Summit Racing‘s pricing. And while we’ll get to the dirty details of just how these cars did with mods, we first had to find out how they did right out of the box. But before we do that, let’s get one thing crystal clear: The baseline results in no way affects our competition. While it does establish the process by which we will measure each car when they have been equipped with some serious go-fast goodies, setting the stock numbers is just a way for us, and you, to see how far these cars have come from stock. There are no points awarded to either team for these results, though they did come with some serious crap talking in the office. So let’s get down to it, shall we? Of course, we had to kick things off with the dyno. While it’s been said over the years that a dyno should be viewed simply as a tuning tool, we were curious to see where the two cars stacked up and thus thought you would be as well. We do know the Camaro out-powers the Mustang right out of the box with a healthy 455 horsepower and 455 lb-ft of torque pumping out of its 6.2-liter pushrod LT1 V8. The Mustang, on the other hand, uses a much different ethos to lay down 435 horsepower and 415 lb-ft of torque at the crank. It does so by using dual overhead cams and considerably less displacement, coming in at 5.0 liters. But what would that translate to in the real world? One other thing we would be remiss for not mentioning is the gearing on these two beasts. The Camaro utilizes an eight-speed 8L90 automatic transmission while the Mustang spins its cogs via a 6R80 six-speed transmission. While there shouldn’t be much difference on the dyno between the two gearboxes, at the track, the Camaro’s additional two gears equate to greater torque multiplication. Just something to keep in mind while we move toward our drag testing. To ensure our cars compete on a level playing field, both were tested within an hour of each other, ensuring that atmospheric conditions wouldn’t tamper with our results. We are using an SAE correction factor that should eliminate most aberrations, but a clear, 71-degree day definitely didn’t hurt our situation. Before testing, both cars were topped off with 91-octane fuel which will be used for all baseline and $5K testing. Up first, and to find out how 455 horsepower translates through the 8-speed gearbox, was the Camaro. After strapping the sixth-gen down and bringing the engine up to operating temperatures, we were ready for our first pull. To our surprise, the Chevrolet threw down the gauntlet by producing 408.62 rear-wheel horsepower and 425.40 lb-ft of torque on our Dynojet 224 XLC. Needless to say, the Camaro really impressed us right out of the gate. Calculating for drivetrain losses, if the 455 horsepower rating is to be believed, that is only a 10.2 percent drivetrain loss. Here you can compare the Mustang (left) to the Camaro (right). In stock form, the Mustang and Camaro peak in the 6,000-rpm range but we expect that to change substantially with the upcoming modifications. Whether you want to believe that the drivetrain is ultra-efficient, or that the engine is underrated from the factory, is up to you. But any way you cut it, this LT1 is potent. And what’s more, the Camaro produced 400 lb-ft of torque from 3,000-5,200 rpm, a fat torque curve by any account. Subsequent runs produced similar results of 408.24 horsepower and 425.47 lb-ft and then 402.28 horsepower and 420.74 lb-ft as heat soak began to take effect. With the bar set pretty high, it was time to roll the Camaro out and get the Mustang strapped down. Both our Camaro SS and Mustang GT were dyno'd within an hour of each other, ensuring conditions were as constant as possible. With the Mustang secured and up to operating temperature, we tipped in on our initial dyno run. Our efforts resulted in 356.27 horsepower and 357.23 lb-ft of torque. Not bad, but a far cry from the Camaro. Subsequent runs resulted in similar numbers and left us satisfied that we were getting the right power out of the Mustang. While the numbers are quite different, once the Coyote starts getting modded, and can pull even higher in the rev range, we think we’ll see a whole different story, but on this one, the Mustang came up a bit short. Factoring in drivetrain losses, the number at the wheels would suggest an 18 percent loss in power, which jibes with standard assumed losses from an automatic transmission. Satisfied with the dyno, we headed out to Auto Club Raceway in Fontana, California, to see how our results panned out in the real world. Before heading to Fontana, however, we wanted to make sure both our cars would plant the power bestowed upon them by the big two. For that, we turned to Mickey Thompson, which sent over a set of 305/45R20 ET Street S/S drag radials (PN 3401) to make sure that our test results wouldn’t be skewed by available traction. Constructed with an R2 tire compound, the ET Streets on the rear of both of our cars ensured that ever possible pony made it to the pavement. In fact, the ET Street S/S will be reused when we get to our $5,000 builds. Needless to say, they were more than capable of handling what we threw at them in stock form. Once they were mounted on the factory wheels, we headed out. We could not have asked for a better day. With temperatures hovering in the mid- to high-60s, the density altitude at Fontana sat around 1,200 feet all day. In laymen’s terms, it was a good day to go fast. After teching in both cars, our host and resident hot foot Brian Petty, headed to the line in the Mustang. After bringing the tires up to temperature using the factory installed line lock — or rather trying to — he was ready to set off on his first pass. As the lights came down, Petty stalled the Mustang’s stock converter as best he could and left off the foot brake. His efforts resulted in a 13.05 at 109.1 mph and a less-than-stellar 2.05 60-foot time. It was a little slower than we were expecting, but not much. We knew the car had a 12 in it if we just kept at it so that’s what we did. When we returned to the line with the Mustang for our next pass, air temperatures had risen slightly and we decided to air down the Mickey Thompsons to 19 psi. The previous pass was accomplished with the tires set at 25 psi. On the second pass, Petty gave the car everything he had but it, unfortunately, slowed to a 13.11 at 107.6 but cut its 60-foot time to 1.98. The mile per hour showed us that we were down on power a little but the 60-foot time was encouraging. If we could just get a little better air, we’d be in business. With the sun dipping toward the horizon, we had one last chance to get the car into the 12s. After a solid burnout, Petty rolled to the line for his final pass. After rolling off the foot brake, the Mustang looked to be on a tear and tripped the lights with a best pass of the day of 12.95 at 109.1 mph. With the car finally into the 12s, we were satisfied with the Mustang’s performance. However, it is worth mentioning that the drag radials we were running on the car were very tall at roughly 29 inches. Combined with the Mustang’s 3.15 rearend gear, and the fact that the stock 17-inch wheel and tire combo measure in at 27.2 inches overall, and you can start to see where there is a lot to be gained in the 60-foot. Going to the taller tire, in essence, shifted the effective rear end ratio of the Mustang to a numerically lower number. Though we did the same thing to the Camaro, whose stock overall tire height was 27.6 inches, it has an eight-speed automatic that helps offset the impact of such changes. Between rounds with the Mustang, Petty slid behind the wheel of our 2017 Camaro SS and pulled to the line. While the Camaro lacks the fancy factory-enabled line-lock of the Mustang, Petty managed a good burnout on the Mickey Thompson radials without it. With the car staged, the lights came down and the Camaro was off to the races. 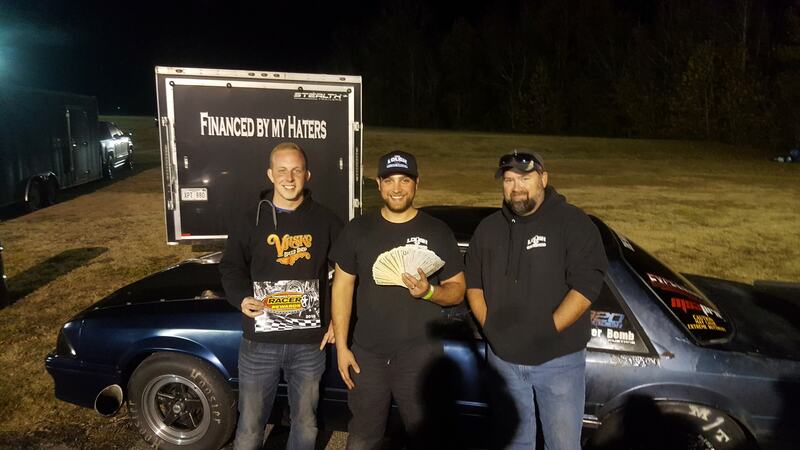 Right off the trailer — or rather right off driving to the track — the Camaro laid down a blistering 12.157 at 113.07 mph. With two passes left in the car, we were left wondering if the Camaro could eventually dip into the 11s bone stock with a set of radials. Alas, our second pass with the Camaro would result in a redlight and thus no timeslip and then our final pass would result in a 12.690 at 114.9 due to Petty trying to take advantage of the Camaro’s factory launch control — which turns out was actually much slower for us, though that may have had something to do with the drag radials being slightly taller in the rear. Nevertheless, we got good numbers out of the Camaro and were satisfied with its performance so we called it quits for the day. While the Camaro was substantially faster than the Mustang, both cars run 12s right off the factory showroom, and that’s nothing to scoff at. To me, and the rest of our crew, it seems as if the Camaro is already maximized right from the factory while the Mustang has some raw potential waiting just below the surface. We’re sure with some tuning, possibly a torque converter and better gearing, the Mustang would have been right there with the Camaro. With the drag race testing in the bag, we turned our attention to Buttonwillow Raceway to find out just how fast our cars galloped around the circuit. Since we don’t have any professional road racers on our staff, we reached out to two seasoned pros to help get our two cars around the track as quickly and consistently as possible. We selected Rob Krider and Drake Kemper to hot-shoe our two cars. Rob is a multiple NASA champion while Drake can typically be found in an IMSA car and recently set the all-time track record at Thermal Club Raceway. Needless, to say, they know what they’re doing when it comes to putting the cars through the twisties. Since we had the Mickeys on the rear of both cars, we made a quick swap to Toyo R888Rs at all four corners, which was more appropriate for the road course. They measure in at 255/35R20 up front and 285/30R20 out back on both vehicles to ensure equal footing — literally. With the tire pressures set at 28 psi cold, we were ready to head out onto the track. To ensure we were getting the best from both vehicles, the drivers swapped cars each session and the tire pressure was adjusted to 28 psi with the tires hot. This helped us to weed out the possibility of one car favoring a driver’s style more than the other. And though both are capable platforms right out of the gate, they were also designed to be daily driven, not mercilessly wrung out at the road course. After the first session, the drivers returned to the paddock to give us their impression. “The Camaro is definitely ready for a hot lap, that’s for sure,” Drake said. “But once you get some heat into the brakes, it starts to be a little less stable.” He proceeded to tell us that while the Camaro was fine for a couple of laps, he had a couple of situations where the pedal went away completely and he would have to cool down the brakes on the Camaro. He also told us that you can smell the brakes immediately. After Rob’s first session in the Mustang, he had similar things to say about it, though he had an even bigger problem with the car than Drake did with the Camaro. “I call the transmission on this car ‘the guess box’ instead of the gearbox,” Rob said, halfway joking. “It doesn’t exactly hold the gear you want and when you accelerate out of a corner it sometimes finds the right gear, but also sometimes doesn’t.” Even when using the paddle shifters, Rob said that the transmission seemed to want to shift when it wanted to, not when you did. With that feedback, both drivers traded vehicles and strapped back in for another session. After the second test session, we heard more of the same concerns. However, both Drake and Rob preferred the steering in the Mustang over the Camaro. “The steering in the Camaro binds up,” Drake said. “It gets to a point where you’re like ‘I know there’s more steering angle in this’ and you kind of have to fight your way past that point.” And though they both agreed on steering feel, they also agreed that the Camaro’s magnetic ride suspension felt much more sorted than the Mustang. Even though the big Brembo brakes may have been less than confidence-inspiring in their factory trim, the two pros managed a best time of 2:09.234 in the Camaro and 2:10.856 in the Mustang. And while the Camaro was the obvious winner here, the difference isn’t as large as you’d think. Considering how much faster the Camaro was in a straight line, we expected a much larger difference in track times. However, once the Mustang is high in the rev range, and can stay there, it really closes the gap on the Camaro. To sum it up, the Camaro was the Mustang’s superior in every test we threw at both cars. And though that does give the Camaro a bit of a head start, it seems as if the Mustang wasn’t nearly as behind as you would think. Once we sort a few of the Ford’s issues with a little bit of modifying, we know it will be a contender for the title of Pony Wars. Stay tuned for our next episode as we get to building both these bad boys, the way God intended.